We met Gwen through Fort Edmonton Park, where she spends weekends in the preserved home of her ancestor, sharing with countless guests the stories that she learned from her family and from reading Erasmus’ memoir, Buffalo Days and Nights. Her family overflows with pride with the connection – and with good reason. Peter Erasmus is, in many ways, the “Little Big Man” of Western Canada. This adventuresome Métis from Red River found himself in almost every expedition, treaty signing, and mission of importance from the 1850s to the 1870s – sometimes in a key role, at the very least in the background; a walk-on extra in the stories that shaped the North-West. Peter Erasmus, Metis. Alberta c 1890. Born June 7th 1833 at Red River settlement, son of Danish father and Metis mother. Studied for Anglican ministry then acted as guide, interpreter, gold miner, hunter, and free trader. From 1908-1911 was Assistant Issuer on the Blackfoot reserve, southern Alberta. Died at Whitefish Lake, May 27, 1931. Image courtesy of the Glenbow Archives, na-3148-1. I’m under no misapprehension that my colleagues and I, engaged in a modest project to tell some of Edmonton’s stories through comics, are the first ones to be entranced by Peter’s stories – nor the first to share them. Henry Thompson wasn’t the first, but he did record Peter’s stories as the old adventurer dictated them. Irene Spry came decades after, editing the memoir for a new generation. Ask anyone possessing a passion for Alberta’s history to name a local Métis with a long shadow and they might mention Jerry Potts, or Malcolm Norris, but they’ll always come up with Peter Erasmus. Why are Peter’s stories so enduring? Why are they retold so often? Peter not only witnessed the prominent events shaping the West, but in his memoir he tells them with delight and dynamism – and a familiarity that leads one to think of him as ‘Peter.’ His stories leap off the page. Alberta’s great historian of Indigenous narratives, Hugh Dempsey, suggests that Peter “follows a Native practice in telling his story. When an [Indigenous person] recounts an historical event, whether or not he was part of it, he describes it as through he was there, complete with conversations.” One shouldn’t think of this as a tall-tale, or a fictionalization, he cautions; it is a mark of Peter’s Indigenous roots as a Métis man and an honour to the oral history that spans time immemorial on Turtle Island. Buffalo Days and Nights is an oral story committed to paper and, with Gwen’s passion, brought back to its oral roots. We are excited to try to convey the magic of a spoken story with images along with the words: the racing of the dogs; the icy cold of an Edmonton winter; and the fort’s fiddle-filled wintry nights. As comics ‘grow up’ in the public mind, populate the bookshelves of mainstream retailers, and go viral across the web, more and more people are acknowledging their storytelling power. The Edmonton Police Service has released its own comic series, as has the Fort Whoop-up Interpretive Society. 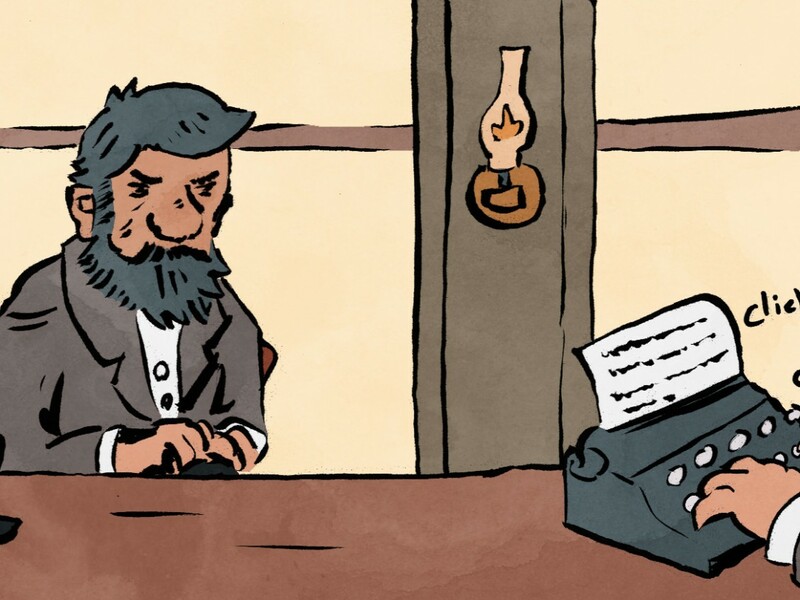 Chester Brown shocked readers with his intimate and affecting comics biography of Louis Riel, while Kate Beaton has risen to modest fame for her history and literature influenced Hark, a Vagrant! webcomic. Using comics for non-fiction history isn’t new, either. Father Lacombe featured in a series of old newspaper strips with an aim to sharing his story – and, if you really want to get down to it, Trajan’s Column in Rome is a picture-based narrative of historical events. So is the Bayeux Tapestry (check out Scott MacLeod’s Understanding Comics for more comics heritage). Our purpose, with this project, is to ask Edmontonians what stories resonate with them and their communities and share them in comics form. We hope that this is nothing less than a “verbal act” of hospitality from each community to the others – sharing identities and themes that make up our vibrant city.